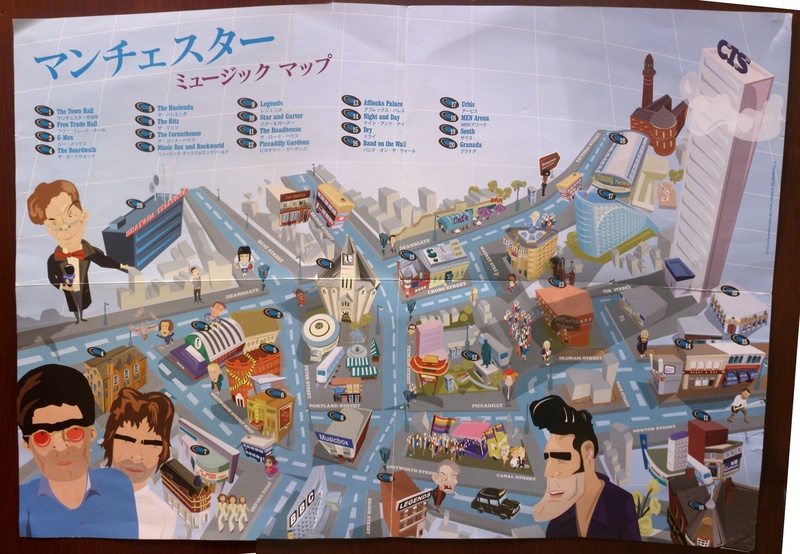 Now, I don’t speak any Japanese, but a few minutes on Google translate told me that the word in blue is ‘Manchester’. The second word is probably ‘music’, as it matches the first word below Music Box and Rockworld. Any suggestions as to the last word of the title, please feel free to comment below. 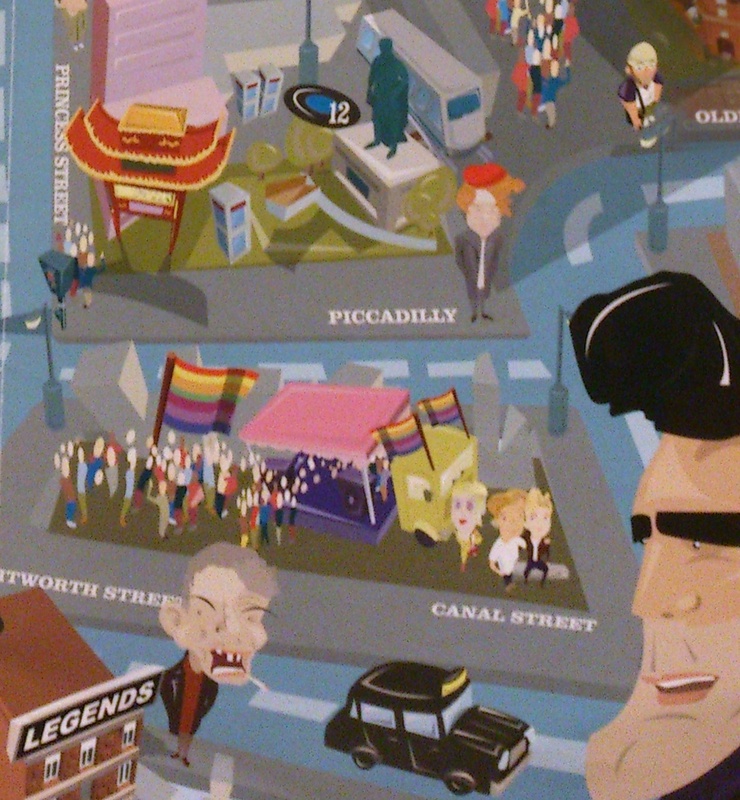 Even if I don’t know the full title of the map, there’s no mistaking the theme – the legend lists twenty music venues around the city and many Mancunian musicians can be seen wandering the streets. 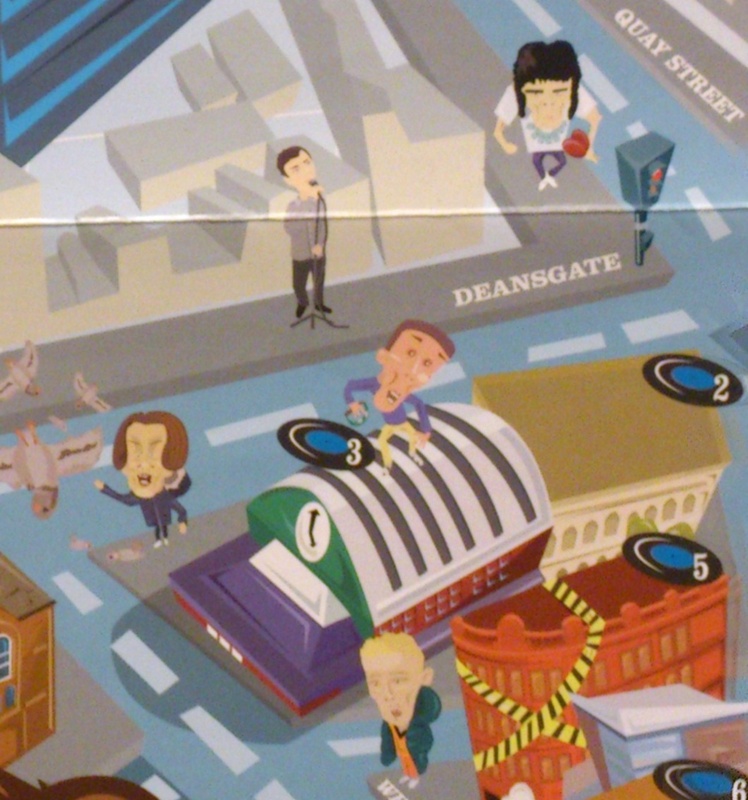 The monobrowed Gallagher brothers loom out of the lower left corner, a bequiffed Morrissey is to the right, and the sainted Anthony H. Wilson stands next to the old Granada Studios. Yes, I know that he and many of the people shown here are actually from Salford, but they’re on the other side of the river today. Looking a bit closer, there are plenty more characters, though I don’t recognise them all. Perhaps some are just random bystanders – let me know if I’ve missed anyone. Doing some freaky dancing on the roof of GMEX is Bez from the Happy Mondays, while Shaun Ryder gets up to no good with some pigeons nearby. Ian Curtis stands on Deansgate, a very simian-looking Ian Brown is coming round the corner, and I think that’s John Robb outside the Hacienda. 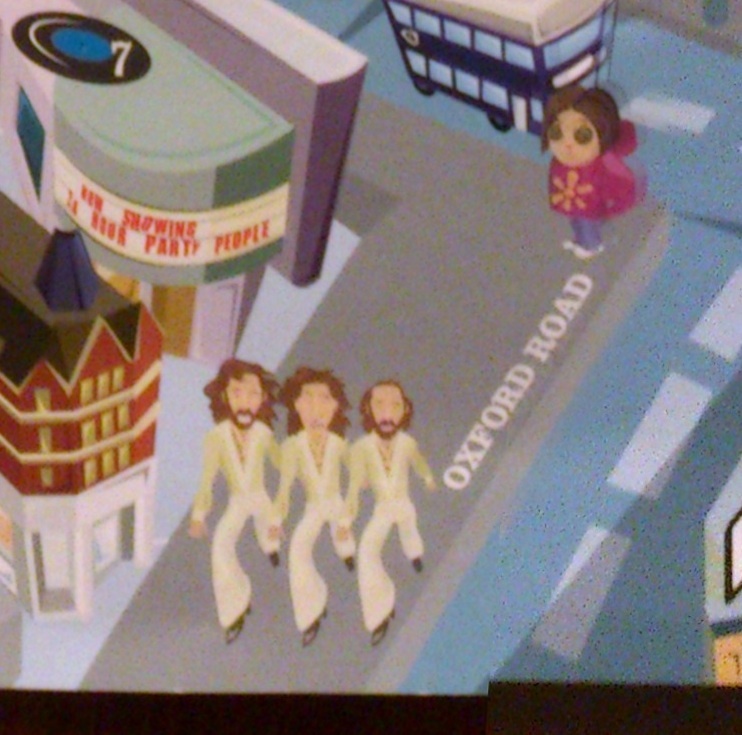 Further south, the Bee Gees are dancing down Oxford Road, while the Cornerhouse is showing (what else?) 24 Hour Party People. 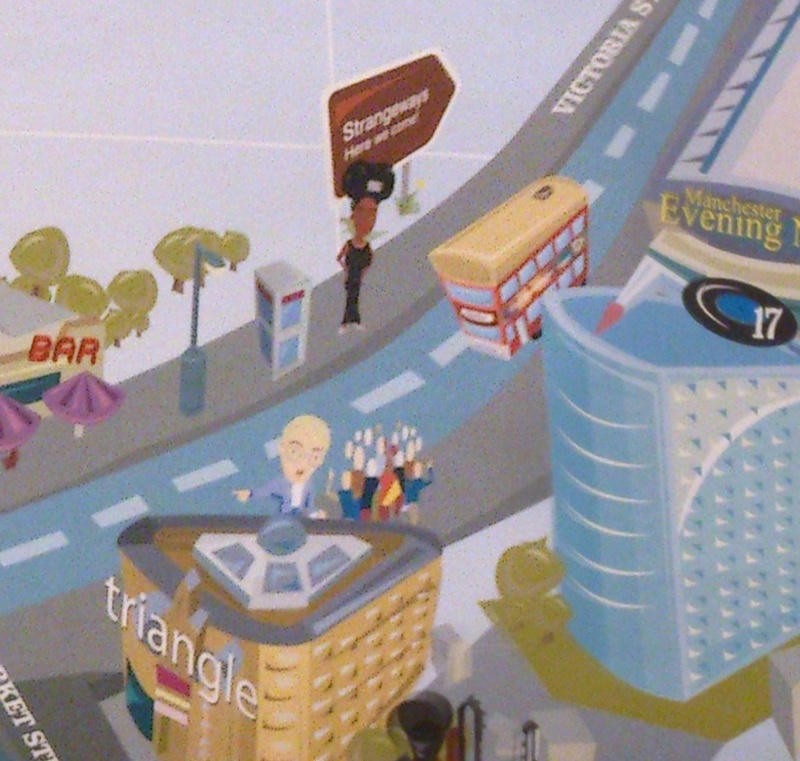 I’m not sure about the guy on the corner – is he a lost raver? Answers on a postcard. Over near Canal Street (where Pride seems to be in full swing), Mark E. Smith is having a good shout at a taxi, and Mick Hucknall is standing in Piccadilly Gardens. Waiting for a bus at the top of Deansgate is Heather Small, and that might be Chris Evans behind triangle, though it could be anyone to be honest. 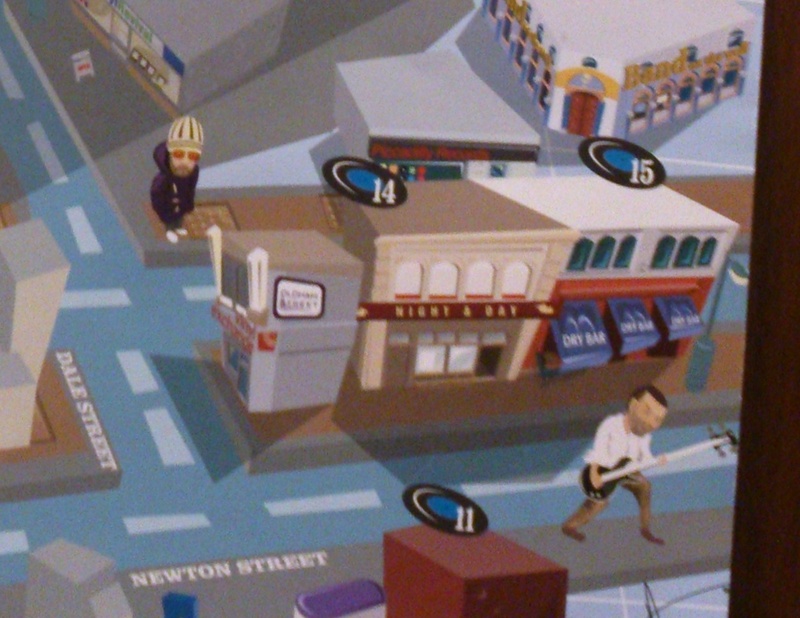 Lurking near Piccadilly Records is Badly Drawn Boy, and that must be Peter Hook outside the Dry Bar. It doesn’t look anything like him, but that’s his stance alright. It’s hard to put a date on this map, but there a plenty of clues. The copyright notice on the right hand side names Creative Lynx, which ceased to exist in June 2012, GMEX was renamed in 2007, and the Hacienda was demolished in 2002. Granada Studios and the BBC only closed this year, as they moved to Media City, and lastly Tony Wilson became the late Tony Wilson in 2007. I think the best guess is closer to 2002, when 24 Hour Party People was likely to be on in the cinema, though given how much popular culture Manchester has to celebrate, it’s probably on there all the time. 4 Responses to Konichiwa Manchester! The second word is ‘map’. That makes sense. Thanks for the link too!